Blackjack Tournaments are fast growing in popularity in the world. The main reason for this is that the house edge is very low at blackjack or there is not any at all. Tournament players compete against one another instead of playing against the casino, a clever player can earn good money participating in tournaments. A number of online casinos offer blackjack tournaments. Some of them are free, and there are some others where the player should make payments before plunging into the competition. Some of the tournaments are available only by invitation, the entry to such tournaments is given to VIP or loyal players. Besides, buy-ins can be given as a prize that gives the player an opportunity to win larger prizes. A blackjack tournament is similar to "standard" blackjack - participants play against the dealer, but in the tournament the real money isn’t the bet chips, but the remaining size of every player’s stack after every round. Every player is assigned to some table and all players start with the same chip stack. Contestants play blackjack over a definite time period or number of hands and at the end, the player with the most number of chips becomes the table winner. Then table winners compete against one another until they are cut down to six or seven finalists to compete for the first prize. There are single table and multi table tournaments. Single table tournaments run in two different formats: Head to Head and Sit ‘n’ Go. Single table blackjack tournaments are played with a limited number of players (usually two to five) and consist of one level. Online casinos offer different kinds of single table tournaments, ranging from 3 up to 30 hands. Sit ‘n’ Go start when the required number of players joins the tournament. 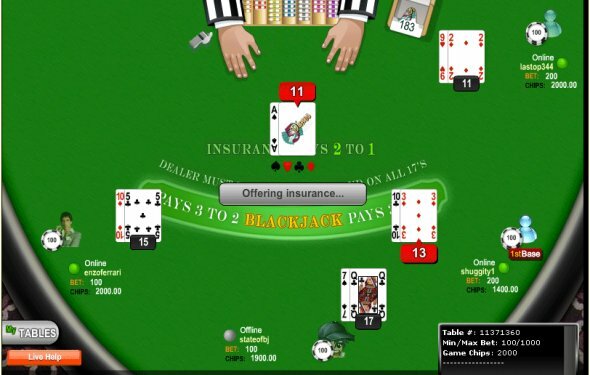 Multi table blackjack tournaments have several levels. Depending on the number of participants in a tournament, there are usually two to five players at every table. There is a choice of multi table blackjack tournament levels such as 3, 5, 10 and 15 hands-per-level. The player who has won the most chips at the end of a level goes to the next level. One of the most popular blackjack tournaments available on the Web is Elimination Blackjack. The player plays against the dealer and tries to accumulate the most chips through a specified number of hands in order to avoid eliminations. One or two top players from every table move to the next round till the winners are found. There are also non-elimination tournaments. Any player competes against all the other players with the aim to win the most money within several rounds. Players are not eliminated in this type of the tournament. Some casinos offer freeroll tournaments that are free as it is clear from the name. Not only is the freeroll a great opportunity for a player to practise blackjack skills, but it is also a chance to win a guaranteed prize pot! Fear vs Optic Black Ops GameBattles Online Tournament.